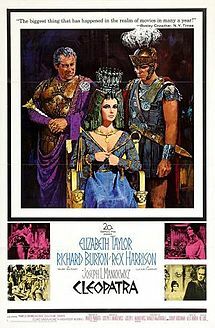 Cleopatra chronicles the struggles of Cleopatra VII, the young Queen of Egypt, to resist the imperialist ambitions of Rome. In all of cinema history, Cleopatra is the most expensive film ever made (adjusted for inflation). Despite being a box office failure, it received positive reviews from critics and audiences alike praised Elizabeth Taylor and Richard Burton’s performance. The movie won four Academy Awards. It was the highest grossing film of 1963, earning US $26 million ($57.7 million total), yet made a loss due to its cost of $44 million, the only film ever to be the highest grossing film of the year yet to run at a loss. The film opens in 48 B.C. shortly after the Battle of Pharsalus where Julius Caesar (Rex Harrison) has defeated Pompey. Pompey flees to Egypt, hoping to enlist the support of the young Pharaoh Ptolemy XIII (Richard O’Sullivan) and his sister Cleopatra (Elizabeth Taylor). Caesar pursues and meets the teenage Ptolemy and the boy’s advisers, who seem to do most of the thinking for him. As a gesture of ‘goodwill’, the Egyptians present Caesar with Pompey’s head, but Caesar is not pleased; it is a sorry end for a worthy foe. As Caesar settles in at the palace, Apollodorus (Cesare Danova), disguised as a rug peddler, brings a gift from Cleopatra. When a suspicious Caesar unrolls the rug, he finds Cleopatra herself concealed within and is intrigued. Days later, she warns Caesar that her brother has surrounded the palace with his soldiers and that he is vastly outnumbered. Caesar is unconcerned. He orders the Egyptian fleet burned so he can gain control of the harbor. The fire spreads to the city, burning many buildings, including the famous Library of Alexandria. Cleopatra angrily confronts Caesar, but he refuses to pull troops away from the fight with Ptolemy’s forces to deal with the fire. In the middle of their spat, Caesar begins kissing her. The Romans hold, and the armies of Mithridates arrive on Egyptian soil. The following day, Caesar passes judgment. He sentences Ptolemy’s lord chamberlain to death for arranging an assassination attempt on Cleopatra, and rules that Ptolemy and his tutor be sent to join Ptolemy’s now greatly outnumbered troops, a sentence of death as the Egyptian army faces off against Mithridates. Cleopatra is crowned Queen of Egypt. She dreams of ruling the world with Caesar. When their son Caesarion is born, Caesar accepts him publicly, which becomes the talk of Rome and the Senate. Caesar returns to Rome for histriumph, while Cleopatra remains in Egypt. Two years pass before the two see each other again. After he is made dictator for life, Caesar sends for Cleopatra. She arrives in Rome in a lavish procession and wins the adulation of the Roman people. The Senate grows increasingly discontented amid rumors that Caesar wishes to be made king, which is anathema to the Romans. On the Ides of March in 44 B.C., the Senate is preparing to vote on whether to award Caesar additional powers. Despite warnings from his wife Calpurnia (Gwen Watford) and Cleopatra, he is confident of victory. However, he is stabbed to death by various senators. 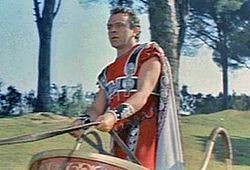 Octavian (Roddy McDowall), Caesar’s nephew, is named as his heir, not Caesarion. 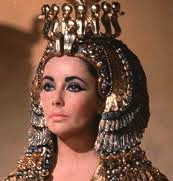 Realizing she has no future in Rome, Cleopatra returns home to Egypt. Two years later, Caesar’s assassins, among them Cassius (John Hoyt) and Brutus (Kenneth Haigh), are killed at theBattle of Philippi. The following year, Mark Antony (Richard Burton) establishes a second triumvirate with Octavian and Lepidus. They split up the empire: Lepidus receives Africa, Octavian Spain and Gaul, while Antony will take control of the eastern provinces. However, the rivalry between Octavian and Antony is becoming apparent. While planning a campaign against Parthia in the east, Antony realizes he needs money and supplies, and cannot get enough from anywhere but Egypt. After refusing several times to leave Egypt, Cleopatra gives in and meets him in Tarsus. Antony becomes drunk during a lavish feast. Cleopatra sneaks away, leaving a slave dressed as her, but Antony discovers the trick and confronts the queen. They soon become lovers. Octavian uses their affair in his smear campaign against Antony. When Antony returns to Rome to address the situation brewing there, Octavian traps him into a marriage of state to Octavian’s sister, Octavia (Jean Marsh). Cleopatra flies into a rage when she learns the news. A year or so later, when Antony next sees Cleopatra, he is forced to humble himself publicly. She demands a third of the empire in return for her aid. Antony acquiesces and divorces Octavia. Octavian clamors for war against Antony and his “Egyptian whore”. The Senate is unmoved by his demands until Octavian reveals that Antony has left a will stating that he is to be buried in Egypt; shocked and insulted, the Senators who had previously stood by Antony abandon their hero and vote for war. Octavian murders the Egyptian ambassador, Cleopatra’s tutor Sosigenes (Hume Cronyn), on the Senate steps. The war is decided at the naval Battle of Actium on September 2, 31 B.C. where Octavian’s fleet, under the command of Agrippa, defeats the Anthony-Egyptian fleet. 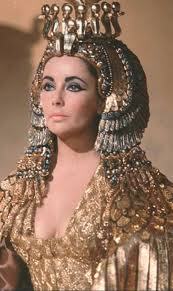 Seeing Antony’s ship burning, Cleopatra assumes he is dead and orders the Egyptian forces home. Antony follows, leaving his fleet leaderless and soon defeated. Several months later, Cleopatra manages to convince Antony to retake command of his troops and fight Octavian’s advancing army. However, Antony’s soldiers have lost faith in him and abandon him during the night; Rufio (Martin Landau), the last man loyal to Antony, is killed. Antony tries to goad Octavian into single combat, but is finally forced to flee into the city. When Antony returns to the palace, Apollodorus, not believing that Antony is worthy of his queen, convinces him that she is dead, whereupon Antony falls on his own sword. Apollodorus then takes Antony to Cleopatra, and he dies in her arms. Octavian captures the city without a battle and Cleopatra is brought before him. He wants to return to Rome in triumph, with her as his prisoner. However, realizing that her son is also dead, she arranges to be bitten by a poisonous asp. She sends her servant Charmian to give Octavian a letter. In the letter she asks to be buried with Antony. Octavian realizes that she is going to kill herself and he and his guards burst into Cleopatra’s chamber and find her dressed in gold and her and her servant Iras dead while an asp crawls along the floor. Octavian is angry that she is dead and leaves. One of Octavian’s guards asks dying Charmian if the queen killed herself well and Charmian answers, “Extremely well” and dies.